I don't know about 60 being round the corner, I have only a month to go. Still off on the sick list, but after the way I've been treated by MOD sod 'em, I'm in no hurry to declare myself cured. Besides, nobody seems to be bothered anyway, and as for John Bell, you are quite right! We were like that as kids because all the things kids have nowadays did not exist back then and we were the better for it and learned how to handle the brave new world as it happened because we lived through it. Kids today don't know they're alive, although there are a few daring little tykes in my neck of the woods who are just as good at taking risks as we were and they scare the hell out of me with their exploits. Then again weren't we just the same? I'm just fretting because I'm getting older. I don't know if I am quite as ready for retirement as I thought I was. I don't feel any different than I did when I started out on that long road from leaving school till now. A lot of water has flowed under the bridge since then and there are all those wonderful memories to look back on. We had us plenty of good times and bad times and with a bit of luck plenty still to come. It's great to be able to chew the fat over old times. Don't forget that old age is just a state of mind although its a pity the body doesn't think the same. Anyway Tony, keep up the good work. 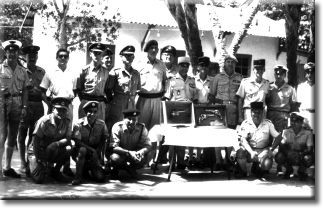 As I have previously mentioned, whilst at Aden in the 1960's, I was secretary of the Aden Forces Pistol Club. 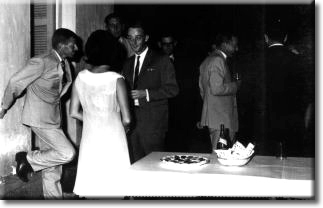 We were a non-public activity in our own time and made up of members of the three services plus MoD civil servants. 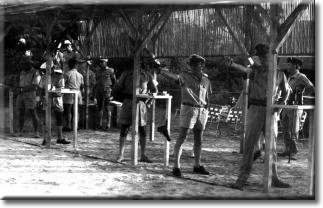 We used the Cemetery Valley firing range at RAF Steamer Point and the club attained a high rate of professionalism in pistol shooting. We therefore invited a team of the French Forces in Djibouti to have a competition with us and they accepted. Naturally, money was not available to lay on a terrific spread but various non-public funds of our members were used - in the usual British way everyone put their backs to job to be done and a wonderful shooting match took place. Coupled with the attractions to the French of the Aden duty free port proved to be a great success. We were met by Capt Pierrestiger of the French Foreign Legion. That's me climbing down the aircraft steps. That evening there was a cocktail party which was enjoyed by all! And so to the competition. Although we acquitted ourselves quite well I suspect that the French Foreign Legion won! The trophies and presentations to the respective teams. After this the French C-in-C visited and paid his respects to our team. Then came the day of departure and the Argosy waiting for us. We had spent a very memorable 7 days as guests of the French which had proven to be an eye opener on how to organise an event to everyone's delight. He is proudly serving as personal driver for OC UKMAMS in Basra driving the new Disco we have acquired out there! :-) He was featured in the Swindon Advertiser a few nights ago or so I'm told as I don't read it. Thanks for the news. Can anybody tell me why the awful things in life always seem to happen to the good guys? Our thoughts go out to Les & family. This coming Sunday, 25th May, we are having a family's Bar-B-Q at the squadron bar, the "Winch Inn" (winge-in to some!) at Lyneham. The event comes with all the usual features: bouncy castle, cheap beer, food, kiddies magician, sand bags - pulling-up Mk1, swinging lamps etc. Don't forget this is another bank holiday weekend so you'll have Monday to sleep it off! The UKMAMS Association have kindly donated £300.00 towards this event in keeping with their policy of providing support to the families of detached movers. (Many thanks on behalf of the currently detached). The event is open to all serving movers, UKMAMS Association members and ex-movers who wish to join the association on the day! (just thought I'd get the advert in - see me on the day for membership forms!). Remember, the UKMAMS Association is now open to all serving and ex-serving RAF Movers, not just those who currently serve or have served on MAMS - So no excuse for not joining! If anyone reading this would like to attend, please contact me so I can add you to the list for food (01249 897422 in MAMS Ops). If you do not have a Lyneham pass and wish to attend, feel free to phone me on the MAMS Ops duty mobile at 07768 996956 and I'll come down to the gate and sign you in (assuming I know who you are!). Subject: Sssssssshhh!! You 'Aint Seen Me - Right? We haven't seen too much of Neil Baldock or Whatty Campbell here in MAMS Ops recently. I don't know where they are working these days but I have noticed some distinctive cars in our car park recently! p.s. 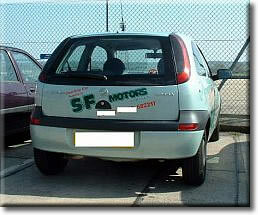 Apologies to S & F Motors of Porth! May 14: Evening Advertiser reporter Martin Vincent was invited to Iraq to see how the country is being rebuilt after the war. 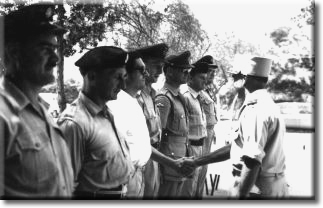 During his visit to Basra in the south of the country he met several RAF men from Lyneham who are heavily involved in this project. It's still not the best of places to be and several of them are obviously missing their families and loved ones and are counting down the days before they return home. But there is a visible pride in the job they are doing. In just a few weeks, working long hours in often stifling heat, they have performed miracles. Lyneham Station Commander Group Captain Ray Lock, was only one of many people Martin met who praised the work being done. Group Captain Ray Lock says the end of Saddam Hussein is the successful climax to a campaign that began twelve years ago. And it's a campaign he has been heavily involved in. Today he is helping to rebuild Iraq so it can be given back to the people. But back in 1991 as one of the RAF's elite Tornado pilots he destroyed strategic targets in Iraq. He flew then as a squadron leader with No 9 Tornado Squadron which was based in Germany, and during that first Gulf War carried out 16 successful operational missions. He recalled, "It was an incredibly difficult time for us. We never dreamed when we were back in Germany what damage would be caused with our laser guided bombs. "Then we destroyed Saddam's strategic targets. "Now we have gone from destruction to reconstruction. Back in 1991 we were attacking and taking out his roads and bridges. But that is all finished now. The Baath Party no longer controls the country ­ it is the people of Iraq." It's ironic that Group Captain Lock, a married man with three children, has now been given the responsibility of relaunching Basra International Airport. Just a couple of miles up the road is a bridge that the former Tornado jet pilot bombed during the first conflict. Not too far away ­ close to the centre of Basra ­ is the oil refinery which he also destroyed. I visited the site of the still-destroyed bridge with the Group Captain and he said: "I am not surprised they have not rebuilt it. "The money was there but the regime chose not to rebuild. They had the food for oil programme and plenty of money but never spent it on the things they should have done." 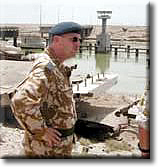 Group Captain Lock is particularly pleased that he has been sent to Basra to help in the rebuilding of Iraq. But he will never forget the time he was sent to bomb the country. He said, "They were exciting times and of course I will never forget them. We came under fire but really the only way we knew we were was from the flashes of the anti-aircraft shells. They could never reach us and our jets had gone before the shells started to explode." May 14: In 1991, Tornado pilot Ray Lock was involved in bombing raids on Iraq during the first Gulf War. Today he is back in the country helping to rebuild Basra airport after the latest conflict. His remarkable story is featured today in the first of a series of special reports. A senior RAF officer who bombed Iraq in the first Gulf War is taking a leading role in the rebuilding of the country following the toppling of Saddam Hussein's regime. In 1991 Group Captain Ray Lock was a squadron leader and Tornado pilot sent in to bomb Iraq. Among the targets he destroyed were a bridge and oil refinery at Basra in the south of the country. 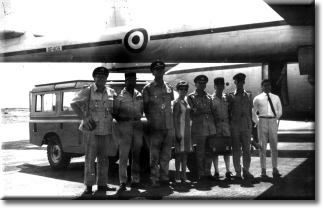 Now fate, and Ministry of Defence planners, have combined to give the 44-year-old Group Captain the responsibility of getting Basra International Airport operating again. It means that while he continues his permanent job as Station Commander at RAF Lyneham he has also been appointed RAF Station Commander at Basra. He said, "My mission over here is to get the airfield up and running again and hand it back as a going concern to the people of Iraq. "It is an exciting challenge and I am confident that this aim will be achieved." Of the 150 RAF personnel under his command at the moment several of them have also been deployed from Lyneham, and Group Captain Lock was full of praise for what they have already achieved. He said, "When we moved in here a month ago the place was in a real mess, but the guys are working 18 hours a day. It is hot, hard work but everyone has risen to the challenge magnificently. They have performed well above their expected capabilities. I am particularly pleased to be here because in the first Gulf War I was a Tornado pilot destroying targets ­ including an oil refinery in the centre of Basra. Now I am helping to rebuild the region to create a better life for the Iraqi people and that is one of the reasons why I am so pleased to be doing this job. We are making the airfield available for use by military aircraft, and civilian aircraft as soon as the situation allows." Two Hercules from Lyneham are now deployed permanently at the airport, and already the first civilian aircraft loaded with 50 tons of mostly medical aid has called in at Basra. Group Captain Lock said the arrival of Richard Branson's Virgin 747 jumbo jet had sent out a message to the world that Basra was open for business. But he knows there is still a long way to go before the airport takes on the role for which it was built ­ as a major international airport. The fact that it is capable of handling aircraft just a month after the war ended is a tribute to the hard work of the RAF personnel. Under Group Captain Lock's leadership the base is gradually being brought back to life. He has brought in specialist RAF fighters and is replacing and improving air traffic control facilities, introducing new navigational aids and plans to upgrade the radar system. A special Command and Control team has also been set up to oversee everything. But although the relaunch project is on course the political will and, just as importantly, the money has to be found to back it. Without it the project will almost certainly fail. But things are starting to look up. Group Captain Lock is optimistic that the American-backed organisation which was set up to sort out the future of Iraq will help. The Office for the Reconstruction and Humanitarian Assistance for Iraq is understood to be in favour of spending a lot of money in the Basra area. If it does it will be good news for the airport ­ and the people of Iraq. Group Captain Lock said, "I am optimistic that the money will be found to revitalise this part of the country, which is very good news indeed." May 15: Hercules pilot Flt Lt Dan Richardson had a very special welcome awaiting him when he flew into Basra International Airport. Standing on the Tarmac as he parked the aircraft at the side of the runway was his new wife Jennifer. She is also a flight lieutenant serving in the RAF and the conflict resulted in both of them being posted to the Gulf where they were able to meet up again. Shortly after Dan had parked the first RAF aircraft to be based in Iraq the couple were reunited and obviously very pleased to see each other. Jennifer, 28, said, "It really is great to see him again. "We only got married at Malmesbury Abbey in October and obviously we don't like being apart for too long." But it's unlikely that the couple will be able to spend too much time together. Everyone deployed to Basra International Airport works long hours and Dan, who is 30, will be constantly flying around the Gulf area on re-supply missions. Shortly after he had landed, the order came through that the aircraft had to be prepared as soon as possible to fly onto Baghdad to pick up the engine of a Tornado jet that needed to be changed. 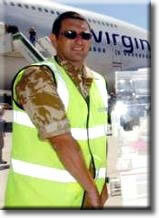 Although a reserve crew would be taking it on, Dan does not expect to get much time off from flying while he is in Basra. His co-pilot for the flight into Basra was Flt Lt Keith Buxton who is also from Lyneham's 30 Squadron. After many hours of flying he said that the Hercules were now "tired aircraft". Because of the demands on them they had had to fly all the way to Basra below 8,000 feet because a window had been broken. "I don't know how it happened but at the moment they are very tired aircraft," said Flt Lt Buxton. 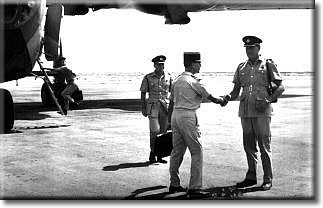 May 15: The first Royal Air Force aircraft to be based in Iraq have arrived on station ­ two Hercules from RAF Lyneham. The aircraft arrived at Basra International Airport at the end of last week. The way had been prepared for them by small teams of ground crews from the base who had been sent in to do that particular job. The arrival of the two new J-model Hercules marks an important stage in the recon struction of Iraq. About 200 RAF personnel ­ many of them from Lyneham ­ are currently working around the clock to relaunch the airport and hand it back to the people of Iraq for them to run. The fact that the Hercules are now at Basra full time is evidence that the airport is secure and able to receive aircraft. Over the next few months it is expected to become much busier ­ and hopefully will see civilian airlines using it again. Up until their deployment to Basra, the two Hercules were working with four other transporters from Lyneham's 24 and 30 Squadrons from a base in southern Arabia. During the war, and since the main hostilities ended, the aircraft have been flying regular supply missions for coalition forces in Kuwait, Basra and Baghdad. Their arrival at Basra means that they are more central to the theatre of operations and are proof that things are starting to get back to normal in Iraq. Squadron Leader Rob Shields is the senior engineering officer with 24/30 Engineering Squadron ­ and his detachment has the responsibility of keeping the planes airworthy. He and other members of his Squadron left Lyneham on March 3 with the six aircraft for the base in southern Arabia. "We were using them to move supplies and men around the theatre of operations and now things have calmed down a lot, four Hercules have returned to Lyneham and the other two are now here," he said. The aircraft will be serviced by a 15 strong team of engineers ­ and if a decision is made to base more aircraft in Basra more support staff will be flown out. Squadron Leader Shields, 39, is full of praise for the new model J Hercules which arrived at Lyneham over the last two years. "It is an excellent aircraft with a real good capability and excellent potential," he said. Basra is going to be a busy time, but overall things have gone very well for us. Everyone is working hard over long hours and we have moved a lot of freight," said Squadron Leader Shields, who is a married man with two children and lives at Stanton St Quinton, near Hullavington. May 15: George W Bush has said that the main conflict is over. But now the campaign is under way to re-establish Iraq as a democratic and thriving member of the international community. Personnel from RAF Lyneham are playing a major role in achieving this. Those he met were stationed at Basra International Airport where they are working flat out to relaunch the airport and give it back to the Iraqi people to run. The main buildings at the airport were not damaged when coalition forces launched their invasion to topple Saddam Hussein, but the retreating Iraqi soldiers, and the looters that later moved in, literally removed everything that was not nailed down. Apart from mundane things such as chairs and tables, essential computer, technical, communications and other electronic equipment were all stolen. It's against this background that the Wiltshire airmen have been given the job of getting the airport up and running again and they are well on course to achieve this aim. They are working in temperatures that are already hitting 44C with a wind that at time feels as if a hair drier is being held just inches from your face. On top of this there are the millions of flies, mosquitoes, and toilet facilities that are just about bearable. The men and women are working long hard hours ­ often up to 18 hours a day ­ but there is little complaining. As usual Britain's military are getting on with the job they have been asked to do. 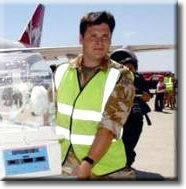 May 16: The latest Gulf conflict is the third major military operation that Corporal Ian Parry has been involved in. 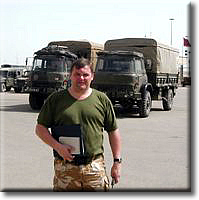 Cpl Parry, who is stationed at RAF Lyneham with the UK Mobile Air Movements Squadron, also served in the first Gulf War and the Bosnian conflict. At present Ian, who is a 33-year-old transport driver, is deployed at Basra International Airport in Iraq where several Lyneham personnel are helping to relaunch the airport. Before moving to Basra he was in Kuwait from where the coalition launched its invasion of Kuwait and it's been non-stop working for him and other members of the MAMS team in Iraq. His duties include driving the "bosses" around and providing them with armed personal protection. When he's not doing this he is helping other members of the MAMS team shift equipment and getting airport vehicles and machinery from the Saddam era working again. Said Ian, "When we got here we were given the job of assessing how much equipment we could salvage. So far we have got seven vehicles up and running and that includes two buses, an aircraft tug, some aircraft steps and baggage handling equipment. If we had not sorted out those steps Richard Branson's Virgin flight could not have come here with its cargo of aid." In fact Ian, who is married to Heidi and has two children Aimee aged seven, and Thomas, four, played a major role in the safe arrival of the 747 jumbo jet. He spent 32 hours over four days driving a special sweeping vehicle cleaning up the runway so that the plane could land. Said Ian, "There were bits of shrapnel left from the battle for the airport, pieces of old Iraqi tanks, loads of nuts and bolts and several spent rounds of ammunition. It was boiling hot in the cab ­ well into the 40s centigrade ­ and the lads had to keep bringing me out bottles of water because I was sweating so much. It is a challenge out here but one that I am enjoying. They are not ideal conditions but I have been in the RAF for 17 years and know what to expect." His son Thomas is disabled and Ian was full of praise for the support being given to his wife by the people at Lyneham. "While I have been away the squadron has been absolutely brilliant, but this is typical of UKMAMS ­ we look after our own." Ian is hoping to be back home around the middle of June, but asked the Evening Advertiser to send this message to his family. "Tell them I love and miss them all and hopefully I will see them soon," he said. Looks like Cpl Gerry Edwards May 19: RAF movements specialists from Lyneham are used to setting up facilities for handling passengers and freight throughout the world ­ many of them in remote places. So it was a bit of a change for the boys from the UK Mobile Air Movements Squadron (MAMS) when they were tasked to do this in what could potentially be one of the top international airports. The only snag is that this airport with its marbled floors, wall tiles and spacious halls is set in the middle of a war zone ­ in the southern Iraqi city of Basra. However it never really got going because the United Nations sanctions imposed on Iraq after the first Gulf War meant that major world airlines could not fly there. But now the latest conflict is over, a decision has been made to relaunch Basra International Airport and hand it back to the people of Iraq as a going concern. Several RAF personnel from Lyneham are involved in this project ­ including the team from UKMAMS. Team leader Flt Lt Gary Sadler said, "Our purpose is to provide handling capabilities for passengers and freight across this theatre of operations and we have detachments in Kuwait, Qatar, and Oman as well as Iraq. Apart from military requirements we are also trained to handle civilian aircraft of all types just like the Virgin 747 that recently flew into Basra carrying aid for the people of Iraq. 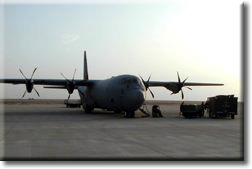 At the moment the main aircraft at Basra are the Hercules from Lyneham, and the airport has all the necessary handling equipment. In fact it has everything that will enable us to handle civilian aircraft as well, which is our aim. We want to bring the place back to its former high standard, and as soon as these other aircraft are given clearance to come in we will be ready for them." Flt Lt Sadler, 29, is impressed with the airport buildings which were not bombed when Coalition forces invaded Iraq. "It is a very spacious well built place and from what I can see surprisingly the Iraqis were very tight on security with two check-in inspection points for passengers and another for the luggage they brought with them." Flt Lt Sadler said several Iraqi engineers were working with the RAF men helping to relaunch the airport. "The atmosphere has been very positive," he said. "The local engineers have worked very well. They understand we are only here to get this place back on its feet to bring in more aid and civilian aircraft for the benefit of the country. Several of them worked here in the Saddam days, and after initially being a little wary, are now coming forward with ways and means of fixing pieces of equipment. It is all very positive. They are a very proud people and we would not want to be seen crowing over them so most of our conversations are on a professional level." Coalition warplanes only targeted one site on the airport ­ a radar station which was completed destroyed after being hit by two precision aimed 2,000lb bombs. Despite the lack of structural damage most of the electronic and computer equipment throughout the airport, along with fixtures and fittings, were taken by fleeing Iraqi soldiers and looters. This initially delayed the work to reconstruct the place back into an operational international airport. May 19: Two members of 24/30 Engineering Squadron from RAF Lyneham are in no doubt about what they have been missing during their time working in the deserts of the Gulf. Corporal Mick Pemberton said: "What I am really looking forward to is drinking a nice cold pint of beer with my fiancée." Cpl Pemberton, 32, has been in the RAF for 15 years and at Lyneham for the past two working on Hercules aircraft. He is an aircraft electrician by trade and enjoys working on the latest state-of-the-art J-model Hercules. He said: "This is a good job and I would not swap it. I am well happy, the J is a better aircraft than the old K model, and it keeps you busy." Junior Technician Andy "Nutty" Nuttall said that all he wants is to be cold again. "I'm sick of sweating in this heat," he said. J/T Nuttall, 29, had already travelled widely with the RAF before being deployed to the Gulf. The other countries he has visited include Bosnia, Cyprus, Canada, and America. Having said that, both men are getting on well working at Basra International Airport after a stint at a base in southern Arabia. May 19: RAF Corporal Geoff Williams is hoping to be back home in Swindon from the Gulf in time to celebrate two family birthdays next month. Geoff lives in Pinehurst with his wife Julie-Anne, stepdaughters Natasha, 12, and Danielle, 10, and son Anthony aged two. He said: "I have not seen my family for three months but have been able to speak to them on the phone. I miss them all dearly and am hoping that I will be able to get home in time for Natasha and Anthony's birthdays in June." At the moment Geoff, who is aged 32, is part of a team from the Lyneham based UK Mobile Air Movements Squadron working to get Basra International Airport fully operational again. "This project we are working on is very worthwhile. It is an excellent facility and with our assistance hopefully we can get the airport up and running again with civvy aircraft using it, and hand it back to the Iraqi people to run. We have got on very well with the local people we have been working with. There is a common bond because we both want to see the airport running properly again. They were particularly pleased when Branson's Virgin jumbo jet landed recently." Geoff said the conflict had been a once in a lifetime experience for him. "I would not want to do it all the time, but I am glad I was part of it. My wife was worried when the bombs first started flying but not so much now things are scaling down and it is much safer." 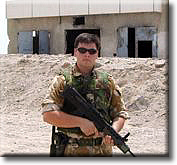 Another member of the UKMAMS team at Basra is SAC Simon Hammond, who is looking forward to getting married on August 24. "Hopefully I shall be back home at the end of this month so that we can finish off planning the wedding," he said. "We have done most of it but as you know there is always something else to do," said Simon, who is aged 26 and lives at Pewsham. He has been in the RAF for more than eight years ­ half of that time with UKMAMS at RAF Lyneham. Simon has visited many countries throughout the world during this time including Pakistan, Oman and Afghanistan. He said, "Before coming to Basra I was in Kuwait for three months and generally things have been alright. It has been hard work, but it was good to see the Branson 747 arrive here with its cargo of aid because it proves we can take big civilian aircraft. We are all confident that we will be able to turn it back into a first class airport." May 19: RAF Flt Sergeant Nigel Malyon [That's funny, he only got his third in March!] was in Afghanistan last year ­ now he is serving in Iraq and he says it's a better place to be. "The living facilities we have and the welfare side of things are much better here," he said. "I think it's because we have learnt from past experiences." Nigel is currently serving with the RAF Lyneham based UK Mobile Air Movements Squadron (UKMAMS) helping to relaunch Basra International Airport in the south of Iraq. He said, "I do enjoy being out here and doing the job I am paid to do. The hours are long but there is nothing else to do. Having said that I do miss things like an English pub and having a couple of pints, and I also miss not having my own car to get around in. The weather is hot but I have adapted to it. It is not ideal but you do get used to it." Nigel, like the rest of the UKMAMS people, agrees that the airport is still in a pretty good condition because the Coalition did not bomb it. However he said there had been quite a bit of damage inside the airport buildings. "Anything that was not nailed down was also taken," he said. "But things are going really well and all the guys have done well. We can handle aircraft already and things are going on improving. Conditions are totally different down here to what we usually encounter, but it is top of the range stuff and the airport is a credit to the German company who built it." 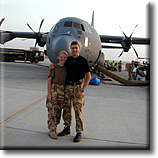 Group Captain runs The Race - in Iraq! May 19: RAF Lyneham's station commander, Group Captain Ray Lock, may have been several thousand miles away for his station's inaugural 10km (six mile) road race last week. But that didn't diminish his enthusiasm; he donned his running kit and raced the distance in the distant Iraqi city of Basra on the same day. The race, which was held on a showery and blustery day in the UK, saw more than 200 local athletes take part on a set course around the airbase. The first male to finish was Steven Paddock, of Swindon Harriers, who completed the 10km in an impressive 33 minutes and 50 seconds. The first female runner to cross the finish line was Christine Double. This was no simple run for her as she had travelled from Hong Kong to compete and completed the course in a time of 38 minutes and 52 seconds. Wing Commander Guy Edwards said: "The inaugural Lyneham 10km Road Run was a testament to the team behind it. The feedback that has been received from the event has been such that there may well be further Lyneham 10 km races in the future." 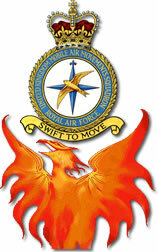 Please add: fsops@ukmams.raf.mod.uk to the distribution list for your weekly e-mail. This will enable me to print it off and forward a hard copy to our detachments in the desert! Not very clever asking me to get info for you and then changing your e-mail address!! Afraid got nowhere with jab docs info and it's probably a lost cause. I remember leaving Hereford for my first posting (Acklington... where?...) and my medical docs never arrived so once again I became a pin cushion! This has happened more than once during my service. Sqn Ldr Axel Jinadu (native Nigerian I believe) well the answer is no, he wasn't with a MAMS Team but i/c 2MT Sqn Stafford hence the elephant symbols on the truck doors. No doubt they all still managed to put in a travel claim. Yes, now there's a Sqn Ldr in charge of MT when it used to be run very efficiently by a mover WO Chick Hatch who earned an MBE for his efforts. Jinadu was never a Team Leader but did a stint as DAMO D with Dave Allen and then as BOpsO. Subject: Re: UKMAMS First Again? Sure I’m not the first but Axel Jinadu is OC 2 MT now. One of the Movers with him in Iraq was Cpl Jock Smith, who during his time there was shot at by the Iraqis, the British and (no surprises as they shot at everyone) US forces. CLAIMS that RAF pilots are too scared to fly the new wave of Hercules aircraft have been fiercely denied by the Ministry of Defence. Norman Lamb, a Liberal Democrat backbencher, has alleged the planes, based at RAF Lyneham, have been dogged by technical faults. Mr Lamb, MP for North Norfolk, claimed some pilots were so concerned by problems with the centre of gravity they were refusing to take off. But in a series of written Parliamentary answers, armed forces minister Adam Ingram insisted all was well with the fleet of 10 aircraft, called the C-130J Mk 5. Mr Ingram released figures showing the C-130J Mk 5 had been flown for a total of 436.5 hours over the last 12 months. And, asked specifically what reports he had received of squadron pilots refusing to fly the short-fuselage planes, he replied: "None". Mr Ingram said: "The centre of gravity of the Mk 5 is a known limiting factor in certain configurations and is overcome by the use of ballast." But Mr Lamb urged the MoD to "come clean" about the problems, which he claimed were common knowledge in military circles. James Gray, Tory MP for North Wiltshire, whose constituency includes RAF Lyneham, also poured scorn on the allegations made by Mr Lamb. Flight Lieutenant John Makinson-Sanders, spokesman for RAF Lyneham, said he was aware that questions were being raised about the aircraft but we was unaware of any pilots refusing to fly the new Hercules. RAF Strike Command had tended to use the Mk 4 version of the Hercules during the missions in the Gulf due to its improved capability. Last week in the television programme, Airbase, focusing on life at RAF Lyneham, a crew flying from Afghanistan had to make a mayday call during a C-130J flight when one of the two flight computers shut down. The crew were so concerned about the failure of the second computer they decided to land at Lyneham for the systems to be checked. Subject: Virus Warning - Yet Again! Message Body: All information is in the attached file. More details at http://securityresponse.symantec.com/avcenter/venc/data/w32.sobig.b@mm.html This page has a tool for removing the virus if you have it. NEW DISEASE BREAKOUT - B.A.R.S. The World Health Organisation (WHO) has just issued an urgent warning about BARS (Beer & Alcohol Requirement Syndrome). A newly identified problem has spread rapidly throughout the world. The disease, identified as BARS (Beer & Alcohol Requirement Syndrome) affects people of many different ages. Believed to have started in Ireland in 1500 BC, the disease seems to affect people who congregate in Pubs and Taverns or who just congregate. It is not known how the disease is transmitted but approximately three billion people world-wide are affected, with thousands of new cases appearing every day. Early symptoms of the disease include an uncontrollable urge at 6 :00pm to consume a beer or alcoholic beverage. This urge is most keenly felt on Fridays. More advanced symptoms of the disease include talking loudly, singing off-key, aggression, heightened sexual attraction/confidence (even towards fuglies), uncalled for laughter, uncontrollable dancing and unprovoked arguing. In the final stages of the disease, victims are often cross-eyed, and speak incoherently. Vomiting, loss of memory, loss of balance, loss of clothing and loss of virginity can also occur. Sometimes death ensues, usually accompanied by the victim shouting, "Hey Fred, bet you can't do this!" or "Wanna see how fast it goes??" If you develop any of these symptoms, it is important that you quarantine yourself in a pub with fellow victims until last call or all the symptoms have passed. Sadly, it is reported that the disease can reappear at very short notice or at the latest, on the following Friday. Side effects for survivors include bruising, broken limbs, lost property, killer headaches and divorce. On the upside, there is not, and probably never will be, a permanent cure.